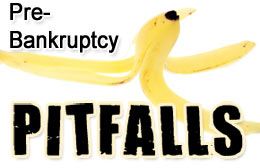 Lookout for Common Bankruptcy Pitfalls! | The Law Office of Emil Fleysher, P.A. Lookout for Common Bankruptcy Pitfalls! | The Law Office of Emil Fleysher, P.A. Home Blog Bankruptcy Lookout for Common Bankruptcy Pitfalls! Bankruptcy can seem like a pretty straightforward process but beware the common issues that arise that can turn your fresh start in to a nightmare. Can you keep your house in Bankruptcy? In Florida, the equity in your homestead property is 100% protected. Article X § 4(a} of the Florida Constitution states: There shall be exempt from forced sale a homestead … upon which the exemption shall be limited to the residence of the owner or the owner’s family. It is well settled law in Florida that the homestead character of a property depends upon an actual intention to reside thereon as a permanent place of residence, coupled with the fact of residence. A debtor’s abandonment of a homestead strips the property of its homestead character for the purposes of the Homestead Exemption. A homestead has been abandoned when it is no longer a “bona fide” home and place of permanent abode. The intention of the debtor is the determining fact in deciding whether a homestead has been abandoned. A debtor can take certain acts, such as listing the property for sale, which may serve to defeat an otherwise valid entitlement to the Homestead Exemption. There many technicalities that can help or hurt your ability to claim a homestead exemption on a property in Florida. Please consult a qualified Bankruptcy attorney to discuss your situation before filing. Do you owe Child Support Payments? If you are a divorcee and you have to make child support payments, these obligations will not be dischargeable in your bankruptcy. Furthermore, if legal fees related to support were awarded to your ex-spouse by the court, those will probably not be dischargeable either. In filing for bankruptcy, you need to include any obligations that you owe or payments that you are entitled to receive. If you owe money to the IRS for back taxes you should consult with a qualified bankruptcy attorney to determine if these liabilities are dischargeable and, if not, how they will be treated in bankruptcy. A good starting point would be to order transcripts of your taxes for the years in question and provide them for your attorney to review. Transcripts may be easily ordered from the IRS. Have you been Using your Credit Cards in the Months Leading up to Filing your Bankruptcy? One type of bankruptcy fraud that the 2005 Bankruptcy Abuse and Prevention Act was designed to prevent involves Debtors who intentionally charge up their credit cards just before filing their bankruptcy. Creditors & Bankruptcy Trustees are have systems in place to prevent this type of bankruptcy fraud and will often object to a debtor’s discharge in instances where more than $600 was charged for non-essential purchases within 90 days of the filing of the bankruptcy. If you have questions about Chapter 7 Bankruptcy or Chapter 13 Bankruptcy, or other alternatives, please feel free to call my office at 888-886-0020, send an e-mail to emil@fleysherlaw.com, or complete the contact form below.